A few days in Bratislava was preceded by an uneventful train ride. It seemed that due to the rain that morning a lot of trains were late, including ours. But we made it okay. The hotel is one of those classic old-world boutique-style places that you really don’t find anywhere else in the world. Sure there was the Crowne Plaza, but I’d rather stay in a hotel that used to be the abbey for the church next door. It’s a different feeling when the bureau in your room is older than your native country. We went out to change some money, as the hotel – which offered the service – said in all honesty much better rates at the bank. And the bellhop actually escorted us the block or so to where he pointed out the back. You don’t get that is Boston. The money changing process was quite involved, in that my passport was scanned at least 7 times, and the two currencies I was converting to Euros (dollars and Zloty) was considered 2 separate transaction. So instead of an extra paper note or two, I got a pile of coins. We went for a short walk nearby and had lunch at the Messerschmidt Café. 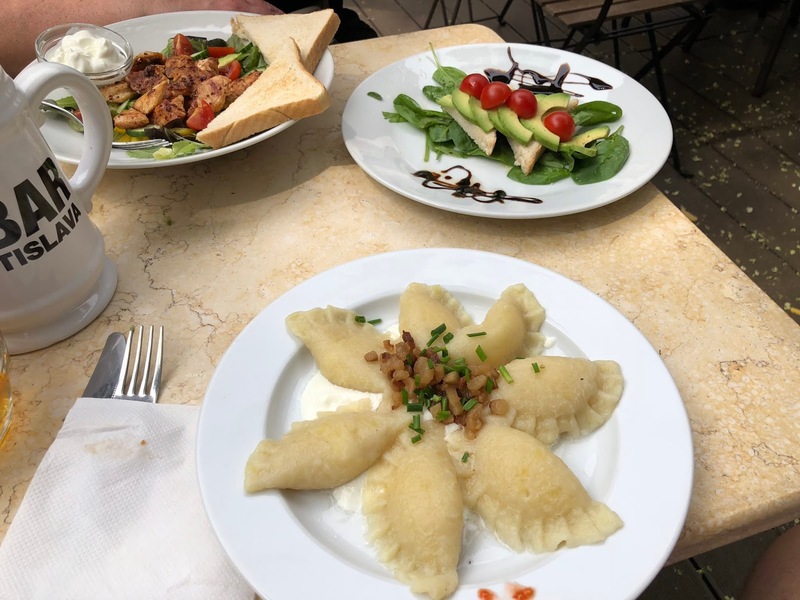 Never had sheep cheese pierogis before. As I was enjoying a local beer from the Kláštorny MonasticBrewery, my wife noticed we were actually next door to the Kláštorny Monastic Brewery. Note a Tmavy Czech lager is a lot like a German Dunkel. But it's not. After lunch walked around the immediate area, before heading back to the hotel. For dinner we met my wife’s 2nd cousin, who had moved to Slovakia over a decade ago. We went to a local restaurant, 1. Slovak Pub. We had an amazing dinner of breads, different meat dishes (chicken and mutton) as well as some local Slovak and Austrian beers.